For a comfortable-as-your-couch outfit, pair a black blazer with blue ripped skinny jeans. Kick up the cool of your look by wearing dark brown leather tassel loafers. 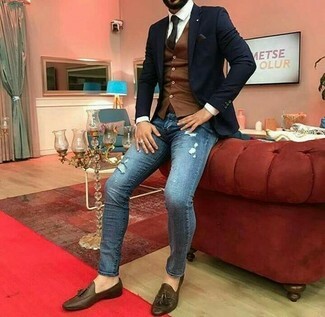 This pairing of a grey overcoat and ASOS DESIGN Asos Super Skinny Jeans With Thigh Rip In Mid Blue from Asos is a safe and very fashionable bet. 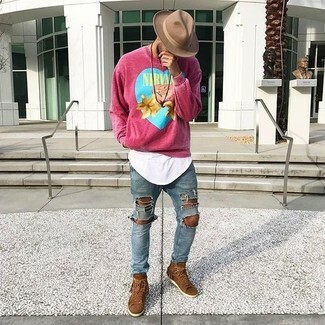 We all seek comfort when it comes to dressing up, and this combination of a hot pink print sweatshirt and ASOS DESIGN asos super skinny jeans with thigh rip in mid blue is a good illustration of that. Rocking a pair of brown suede high top sneakers is a simple way to add some flair to your getup. 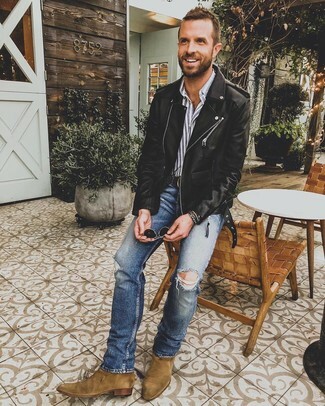 We all seek comfort when it comes to dressing up, and this combination of a black leather bomber jacket and ASOS DESIGN asos super skinny jeans with thigh rip in mid blue from Asos is a great example of that. Bump up the cool of your ensemble by wearing mustard suede brogues. 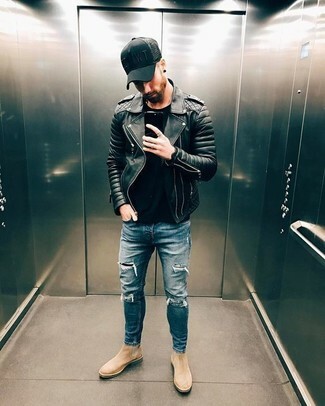 If you're scouting for a casual yet seriously stylish ensemble, pair a navy trenchcoat with ASOS DESIGN asos super skinny jeans with thigh rip in mid blue. Both items are totally comfortable and will look great paired together. For shoes, opt for a pair of navy low top sneakers. Who said you can't make a stylish statement with a casual ensemble? You can do that efforlessly in a black leather biker jacket and ASOS DESIGN blue ripped skinny jeans. Introduce brown suede chelsea boots to the equation to instantly step up the fashion factor of your look. Pair a black quilted leather biker jacket with ASOS DESIGN asos super skinny jeans with thigh rip in mid blue for a relaxed take on day-to-day wear. 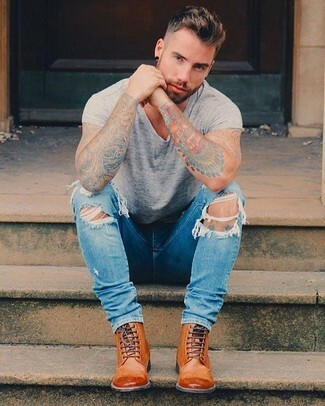 Wearing a pair of beige suede chelsea boots is an easy way to add some flair to your look. 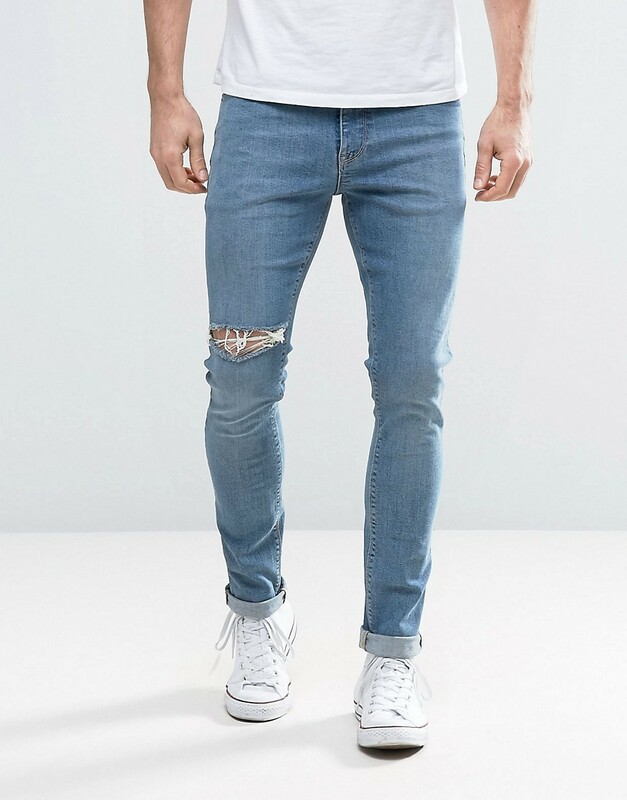 We all seek comfort when it comes to dressing up, and this combination of a grey crew-neck t-shirt and ASOS DESIGN asos super skinny jeans with thigh rip in mid blue is a vivid example of that. Wearing a pair of tobacco leather brogue boots is a simple way to add some flair to your outfit. 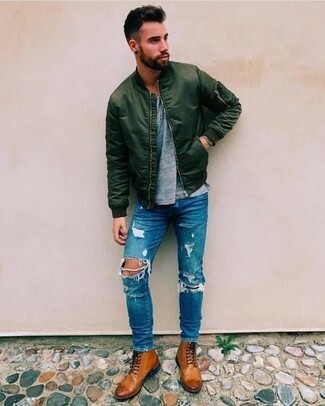 Consider wearing a dark green bomber jacket and ASOS DESIGN asos super skinny jeans with thigh rip in mid blue from Asos to be both cool and relaxed. You could perhaps get a little creative in the shoe department and lift up your look with brown leather casual boots.